Candice approached me when she learned the hospital she was working for was going to shut down and she was going to be out of a job. She had actually hired a professional writer in the past, but was disappointed in the results she got, and went back to her original document. 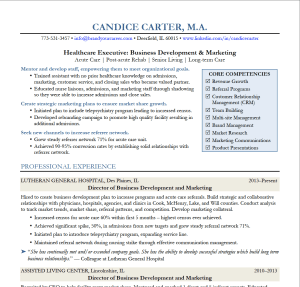 Her current resume was very dense with a list of tasks instead of accomplishments and had no summary section at all. Candice’s goal was to land a more executive-level position because she knew she had the experience and capability to handle it. So I focused on her leadership and business growth skills in the summary section in order for hiring managers to get a quick picture of the value she could bring to an organization. In her experience section I cut down the scope of each position to a few lines and bulleted out her accomplishments so it clearly showed she was a go-getter. In just 6 months after her employer closed, Candice landed her next role.